Day hikes in Manali. 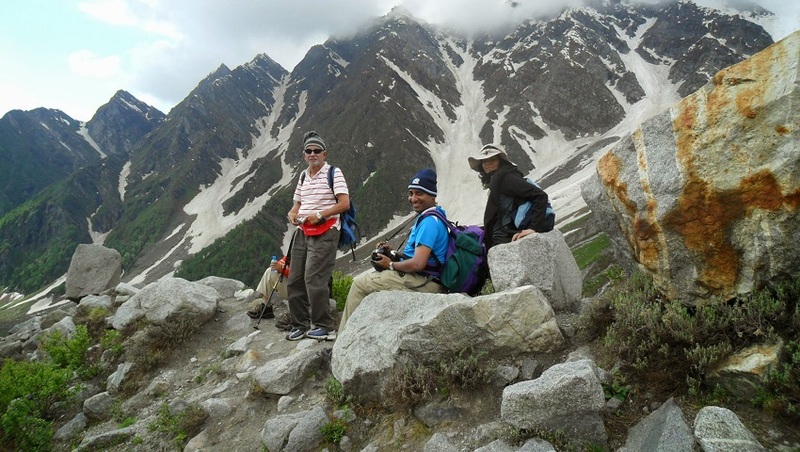 Manali day hikes is for those who want to enjoy a brilliant walk in the outskirts of the Manali town. Starting from a 2000m the day treks goes upto 4000m thus gaining a 2000m altitude in a day. All day hikes starts early morning. After the end of trek some require transportation to get back to Manali and some starts at Manali and ends at Manali. 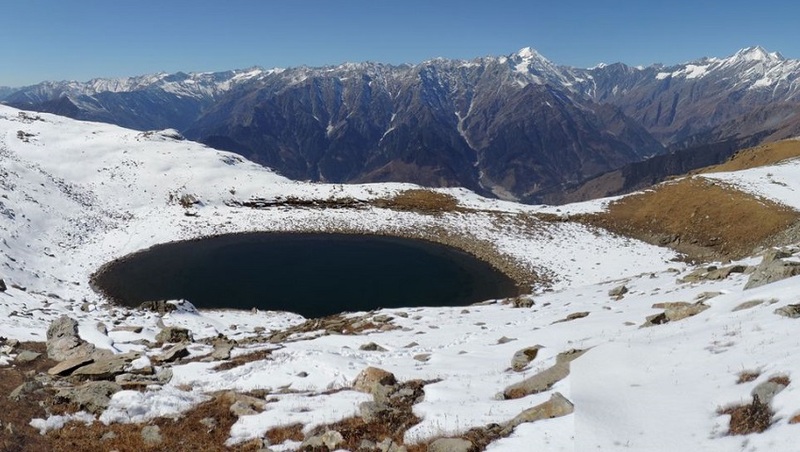 The day hiking tour allows its participants to enjoy the beautiful green forests, above tree line meadows and spectacular view of Pin Pannjal and Great Himalayan range. Potala Adventurers offers its clients four circular routes of choice. We take a 10 minutes drive early in the morning to Dhungri located 2 km west of Manali. Beginning to hike from here you climb gently through thick forest of Cedar and Oak. Climbing up through the Manalsu River valley the gentle slopes and lush green meadows of Lamadug appears. Later hike beneath the Khanpari Tibba to Kanyal where our hike ends. or descend by same trail to Dungri. Your private vehicle will be waiting and drive to Manali. Setting off from Manali we drive to Chichoga village 2000m, starting 8 - 9 hrs hike from here following the trail through thick forest to Chichoga heights where temple is located at the top of ridge. The trail passes through thick forest of Deodar, Oak, walnut and Birch tree to Jobri / Chikka. Upon reaching the Chikka you get the picturesque view of snow-capped mountains. Spend your time at Jobri / Chikka close to Hamta River and by the end afternoon drive back to Manali. OR Manali to Jobri drive and start hike from here to Chhikka which takes 3 hrs, explore around Chhikka and retrace back to Jobri and finally from Jobri we take trail to Chadiyari near Vashisht 5 hours. drive to Manali. High above Sethan village 2700 m there is vast meadows above treeline which finishes at 3200m, this area is famous for winter heli skiing in Manali. From this point you will have close view of Indrasan and Deo Tibba peak north west face. To the west you view of Beas river valley. During summer entire area is carpetted with wild flowers and herbs. It takes 30 minutes by vehicle from where this day hike starts. This is strenuous day hike to Bhrigu Lake. Leaving early from Manali you drive to Gulaba 1 hr from where hike begins. At first steep climb through alpine meadows to Rauli Kholi further trail goes through boulders and loose rocks to tiny lake known to locals as Bhrigu Lake. Situated at a height of 4160m. With panoramic view of Pir Panjal, Dhauladhar, Great Himalayan range. Spending few time at lake its long descent along the Panduropa slopes to Vashisht. This is another strenuous day hike to Piang Neru where only few find there way here. Leaving early from Manali you drive to Jobri and steep ascent to Marhi,from where the first view of Deo Tibba apprears. Gradul trail to Piangneru and crossing the Jobri stream ascent to Sethan dome which provides magnificent view of Beas River valley. Finally long descent to Sethan village where trip ends and drive to Manali. East of Solang and the head of Kullu valley there is a small peak which present spectacuar view of Beas river valley running South. Setting off from Solang the trail passes through apple orchards, corn fields and alpine meadows. The North wall or north of Solang lies the main peaks which remain in sight during this day hike. Those peaks are Hanuman tibba, Friendship peak, Ladakhi peak, Maker beh etc. This peak remain open throughout the year, during winter skiers go here and during summer this area is filled with campers, hikers. 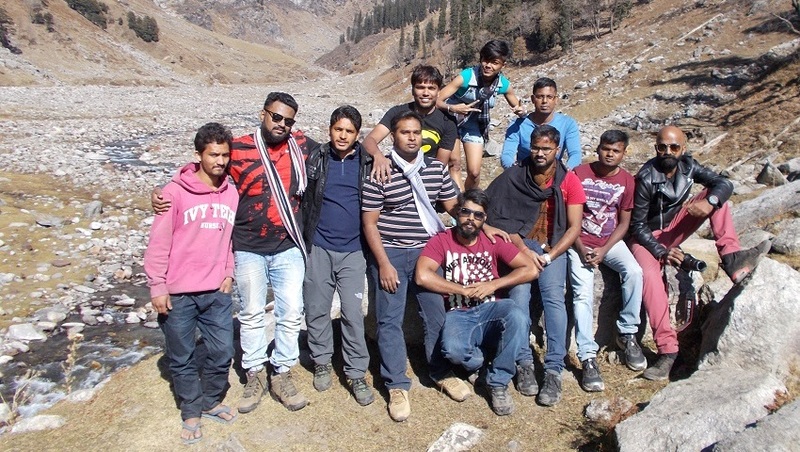 Day hike from Vashisht to Jogini falls and to Nehru Kund (4 to 5 hrs). Day hike from Old Manali to Mangankot. 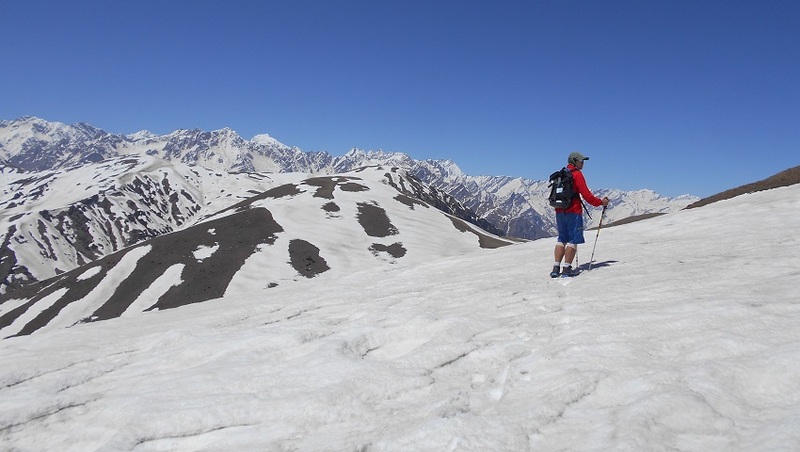 Day hikes or day treks in Manali is for those who want to enjoy a brilliant walk in the outskirts of the Manali town. Starting from a 2000m the day treks goes upto 4000m thus gaining a 2000m altitude in a day. All day hikes starts early morning. After the end of trek some require transportation to get back to Manali and some starts at Manali and ends at Manali. 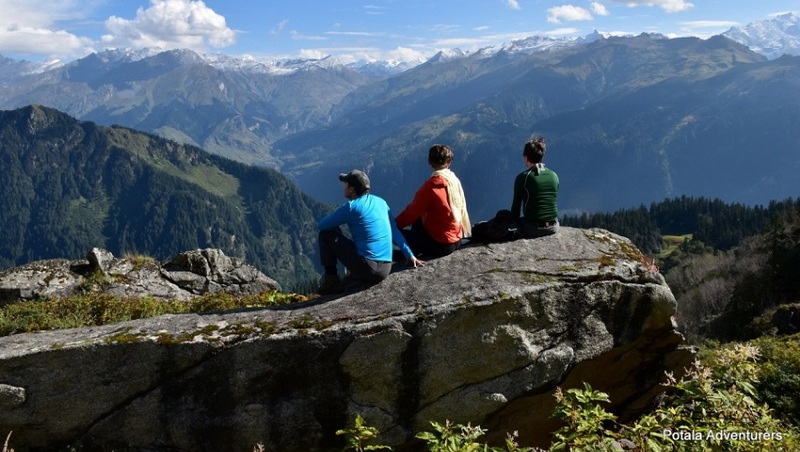 The day hiking tour allows its participants to enjoy the beautiful green forests, above tree line meadows and spectacular view of Pin Pannjal and Great Himalayan range. We take a 10 minutes drive early in the morning to Dhungri located 2 km west of Manali. Beginning to hike from here you climb gently through thick forest of Cedar and Oak. Climbing up through the Manalsu River valley the gentle slopes and lush green meadows of Lamadug appears. Later hike beneath the Khanpari Tibba to Kanyal where our hike ends. Your private vehicle will be waiting and drive to Manali. Setting off from Manali we drive to Chichoga village 2000m, starting 8 - 10 hrs hike from here following the trail through thick forest to Chichoga heights where temple is located at the top of ridge. The trail passes through thick forest of Deodar, Oak, walnut and Birch tree to Jobri / Chikka. Upon reaching the Chikka you get the picturesque view of snow-capped mountains. Spend your time at Jobri / Chikka close to Hamta River and by the end afternoon drive back to Manali. · Entrance fees for museums, monuments and park fees. Ø Entrance fees for museums, monuments and park fees. Ø Nutritious packed lunch with mineral bottles. Ø Ground transportation pick up from your hotel to drop. 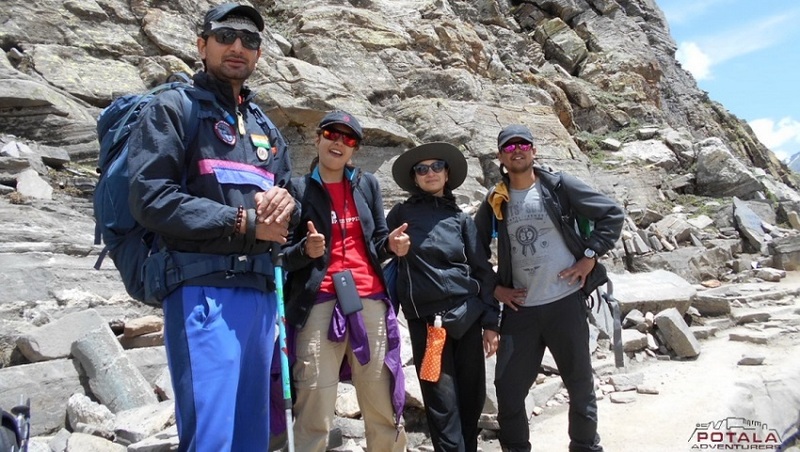 "We are a group of 4 couples planning to trek and camp in Manali area. We found Potala Adventurers online and booked trek and camping with them. Mr Prem was very helpful in guiding us to the right trek. Mr Tenzin also helped us a lot and made arrangements to handle our other luggage's as well. The guides organized by them were very helpful. The entire trekking and camping was wonderful and memorable. All arrangements were hassle free. Thanks a ton to Potala Adventures and Prem and Tenzin for their support. Best wishes"